Like human beings, animals do have right! A right to be respected - They need to be cared, be sheltered and treated fairly. It is unlawful for men to cause malignant diseases to animals. Cockroaches don't smoke, they don't need smoke - basically, they hate smoking. It's not of their priority. They scavenge by nature. They should cause diseases to men - as part of their role to human beings. 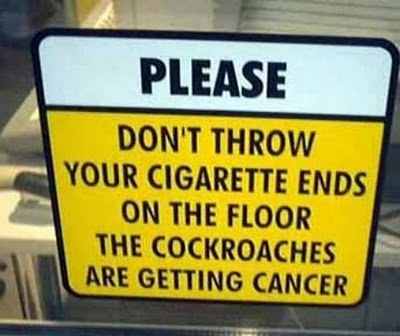 As humans, don't be a cause to their(cockroaches) sickness. Beware, it's a crime. It's both unlawful and unconstitutional! Madami nang nagkakasakit sa'min, buti na lang promulgated na ang smoking ban in public areas, mababawasan na ang mga naninigarilyo at ang pagtatapon ng mga cigarette ends kahit saan, maraming salamat!